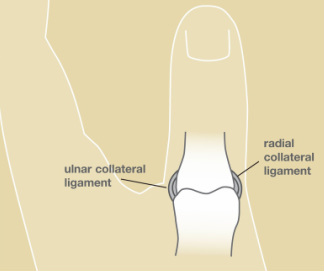 The most common upper extremity ski injury is to a thumb ligament called the ulnar collateral ligament (UCL) of the metacarpophalangeal joint. It is the ligament on the inner aspect of the thumb at the second joint from the thumb tip (see Figure 1). A ligament is the soft tissue that connects bones to bones. 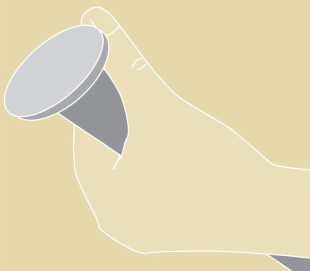 This skii injury occurs when the ski pole does not release from the hand and the pole places a bending stress to the thumb (see Figure 2). If you fall while skiing and your inner thumb hurts, it may be from a “skier’s thumb,” or UCL injury, and you should see a hand s﻿urgeon. Your surgeon will determine whether it is a partial or complete ligament tear. A partial tear is usually treated with a cast or splint, whereas a complete tear is treated with surgery to repair the ligament since the torn end of the ligament often gets trapped behind a muscle. Figure 2: Upon falling, the ski pole may bend the thumb in an extreme position and tear the ulnar collateral ligament causing “skier’s thumb” injury.